Peru’s Congress formally accepted the resignation of President Pedro Pablo Kuczynski (PPK) Friday, as First Vice-President Martin Vizcarra was sworn in as the country’s new president. Vizcarra, who is also Peru’s ambassador to Canada, called for “faith and optimism” when he arrived in Peru on Thursday ahead of his midday swearing-in ceremony. 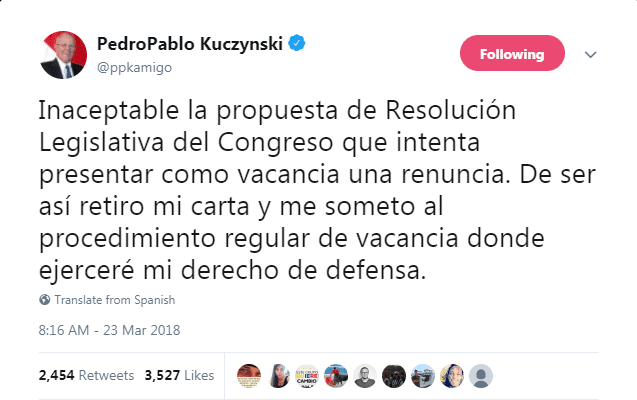 If this option was pursued, he said he would withdraw his resignation letter and “submit to the regular vacancy procedure where I exercise my right of defense.” Kuczynski, a former Wall Street banker, resigned Wednesday after accumulating multiple accusations of corruption. Reuters reported that it was unclear if Kuczynski could legally withdraw his resignation. Vizcarra, sworn in at around midday Friday, called for “faith and optimism” when he arrived in the country Thursday: “Peru can always overcome.” However, left-wing political movement New Peru and half of Peru’s voters believe Vizcarra should call for new elections instead of governing until 2021. New Peru has widespread public support: a recent poll by GFK shows that 49 percent of Peruvians believe Kuczynski‘s two vice presidents should resign and that Congressional President Luis Galarreta should call new elections.